Welcome to the latest edition of the BIR information service for members, the BIR eBrief. This overview of BIR’s activities is published regularly, in order to keep you abreast of the most important ongoing actions within your world recycling federation. The People’s Republic of China’s Ministry of Ecology and Environment, Ministry of Commerce, National Development & Reform Commission and General Administration of Customs announced on December 21 2018 through Notice N°68 in Chinese that, with effect from July 1 2019, eight types of waste and scrap will move from its “Catalogue of Solid Waste Not Restricted to Import as Raw Materials” to its “Catalogue of Solid Waste Restricted to Import as Raw Materials”. Make sure you attend our 2019 world recycling events! Our events provide a powerful, global platform for business. Sponsoring or exhibiting at these well-known gatherings will provide you with a great opportunity to showcase your know-how, products and services to a highly relevant audience. Registrations for BIR Singapore 2019 will open beginning of February. For more information contact bir@bir.org. Global Recycling Day has been named Educational Initiative of the Year by Waste Dive, a leading global industry news publisher. “At a time when the role of recycling is changing around the world, and the desire for environmental action is growing, BIR's new campaign has been well received,” said Cole Rosengren, Senior Editor at Waste Dive. Ahead of its second Global Recycling Day, 18 March 2019, the Global Recycling Foundation is asking children across the world to make better recycling practices one of their 2019 New Year’s resolutions. To help, a list of “seven recycling promises to become a global recycling citizen” has been created, which families, school and youth orientated clubs are being invited to download and share. Youth and education is a key pillar of Global Recycling Day’s 2019 theme “Recycling into the Future” which was announced in October. Global Recycling Day 2019 will focus on the power of youth, education and innovation in ensuring a brighter future for the planet. 1. How can I use less things made of plastic, and recycle those that cannot be reused? Things like drinking bottles, straws and plastic bags. 2. Am I making sure me and my family, and my school, follow our local recycling instructions? 3. Am I doing all I can to make sure the stuff we recycle is dry, clean and in the right collection bins each week? 4. Do I really need everything to be new - am I mending, repairing and reusing the things I own (e.g. clothes, toys, games)? 5. How can I learn more about recycling, and how can I help my family and my friends also be more aware? 6. Do I know how to recycle things like electronics when I no longer want them? 7. Do I recycle packaging when I open and use new things? BIR is happy to report that we closed the year 2018 with a total of 93 members that joined our ranks in the past 12 months. While mergers and company closures due to difficult economic conditions led to a certain number of cancellation, our overall membership base increased by 33. These new members come from across the globe; although the European continent is still font runner, it is surely closely followed by Asia (mainly India and Pakistan). 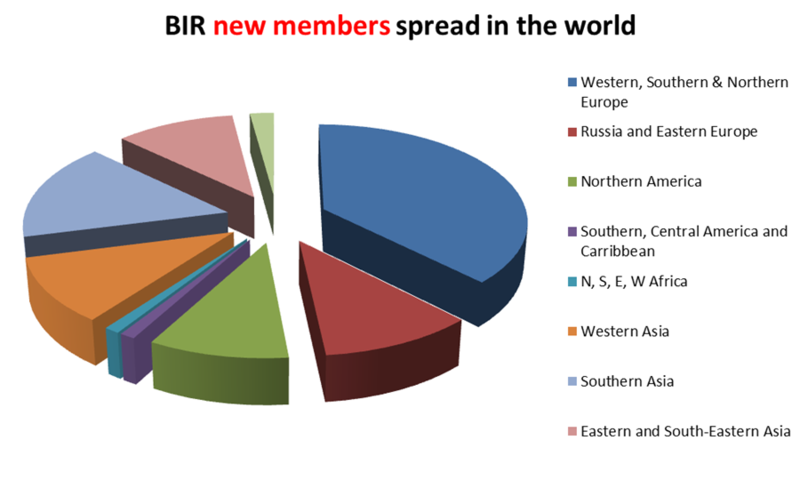 Although BIR membership has its initial roots and thus a major footprint in Europe, its evolution together with these latest statistics clearly articulate the worldwide and global essence of our organization. It seems clear that our membership services and benefits, together with BIR’s reputation as the sole world federation of recycling industries, played an important part in attracting new members and maintaining the loyalty of our long-standing existing members. Moreover, the privilege of participating in the unique forum of our bi-annual conventions provides another major advantage. The close cooperation between the Convention and the Membership Committees ensures that ever-improving framework conditions for enhanced business opportunities at our events provide maximum benefit for all participants, convincing many one-time observers that they should permanently join our ranks.